On my way to Natural Grocers (via car), I was surprised to see in my rear view mirror a group of maybe 25-30 young people (late teens/early 20s) on bikes taking up all of the northbound lanes, swerving, giving motorists the finger, riding in the turn lane, and otherwise acting in a very confrontational way. I was stopped at the light ahead of them, and they reached the intersection, and thank goodness stopped at the red light. They all crowded around my car (super close) and gave me "dirty looks". This whole thing really made me nervous for my own safety and for theirs, because they were riding erratically and heckling motorists. People in cars tried to get around them using the turn lane, which was dangerous, and obviously not a good idea. I don't know if these kiddos are part of the "critical mass" or similar movement, but these actions are unsafe and actually erode public opinion of cycling. It is not helpful for the cycling movement when those on bikes purposefully cause traffic problems and taunt motorists. If anyone knows these folks, I would urge them not to do this. The problem is not cars, it is that the city is not creating safe bike lanes and safe streets like they should, and is instead putting money into things like the mass transit lines instead. (Mass transit can be awesome, but bike lanes and sidewalks have to be there first!) Look folks, I am a bike advocate, but the bike cannot replace cars/trucks. People that have children, the elderly, injured/physically impaired, and those whose professions require them to transport tools, materials, food, etc need cars/trucks. Even people in the "dark ages" used carts with wheels, horses, etc. Transporting "stuff" is part of human life, and as of yet, there is not a more efficient way to do this. Thus, I say, we bike advocates need to really press the city to make more and better bike lanes that are clearly differentiated, and that don't just stop and start randomly,especially on major roadways. There also needs to be better education for motorists and cyclists on "the rules" for both. The hostility between motorists and cyclists is misdirected. We should all be angry with the city for not doing its job. I understand and sympathize with your concerns but I have a question regards ".....and actually erode public opinion of cycling...." Why is it so specific to cyclists that the actions of a few buttholes are thought to reflect on all? I used to go dirt track racing at Texas Thunder Speedway in Killeen Saturday nights. When I was towing my stock car home I would find myself on Mopac after 2:00 Am on a late night. Those nights, I swear I was the only sober driver within miles! I was grateful for the relative safety provided by the sheer mass of an F250 crew cab diesel truck and trailer. Yet it never even occurred to me to suggest that the drunks on the road at that particular time and place represented motorists in general. The double standard, which I don't think is really your thing, makes it evident that many people want to resent cyclists and will find whatever rationale is convenient. I cycle up to, or sometimes over, 100 miles a week and have been doing so for the last few years. I have experienced very little hostility from motorists, revving of engines, laying on the horn, shooting the finger etc., but the two or three times that stand out I was riding not only courteously and safely but entirely within the letter of the law. I do agree that group sounds like a bunch of buttholes. Yep, pretty much. I have to endure that from supposed friends, peers, co-workers family members, and so on and so forth. I've burned down friendships for holding this particular double-standard because I absolutely believe that it, and the strong desire to hate cyclists but not hazardous motorists, makes my life on the road more dangerous. That said, I still don't know what to do when I come across cyclists intent on flaunting every traffic law that exists. Mostly because I'd have to do the same thing to catch up with them and give them a piece of my mind. It's possible the group picked up more people as the ride progressed, but it seems unlikely it would double in size. 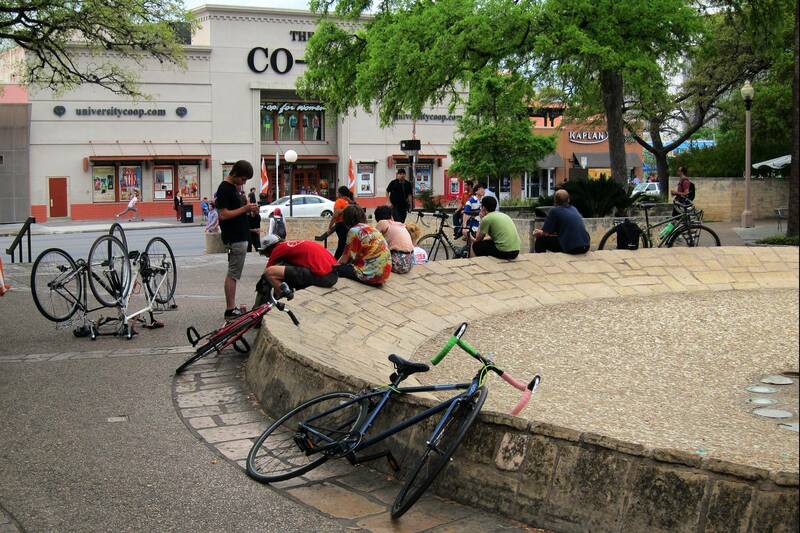 I don't agree with the Critical Mass tactic – as its practiced in Austin at least. That said, the participants yesterday were really young, only a handful looked over 25. It's probably more productive to organize events that present cycling in a positive light than try to keep angry rebellious youth from acting like angry rebellious youth. Thats a picture of me and a few of my buds. I can tell you right now that wasn't us, critical mass often takes all the lanes as a demonstration, but there's no way that was us if people were "heckling drivers" we only had about 14 people and we were all very courteous. I sure as hell didn't go around flipping people off. we weren't even on lamar at all. Critical Mass doesn't have the same rep that it used to. I mean how much damage can you possibly do with 15 people.... know what I mean? hahaha. The city has been doing a lot in recent years to provide bike infrastructure. Also, join the BAC meetings for a more in depth look at what's happening. As for a group of dumb bike riders - they do not represent cyclists. Even the huge Social Ride doesn't represent cyclists. There a hundred different types of people riding bikes. you can't generalize this group. Immature juveniles are simply immature juveniles. The fact that they might happen to be on bicycles is immaterial. Yet we can not seem to escape the double standard where cyclists are stereotyped as most groups are not. So a bunch of punks walk through a neighborhood slashing tires and breaking windshields. Does that reflect on pedestrians?